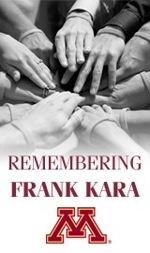 Frank had written this before his passing to be read at his funeral. While meeting with Pastor Buller over the past several months, he said that I could write something that would be read at my funeral. He said I should keep it short. Those of you, who really know me, know that any time I had a captive audience, my comments tended to NOT be short. For me, there was no greater experience then doing a reading during a church service, conducting an educational session at the University, or over the last few years, my greatest joy was teaching classes at the University. Well, today I guess I have the ultimate captive audience. But I will still try to keep my remarks short. If I could write a book about our experiences over the past several months, I would call it “I got cancer, enjoyed the work of a miracle, and I still died.” Kind of an odd title right? On June 16, 2006, Denise and I met with Dr. A, an oncologist who specialized in melanoma. What a day that was. We went from me having a lump in my armpit that was an annoyance over the previous few months, to facing a doctor who told us that I had 4th stage melanoma and may not live 3 months. And as if that was not enough, he said there were no cures. That was a Friday. Over the weekend, Denise and I, as well as my family and hers were all confronted with a brutal mortality. Oh what a weekend it was as we made phone calls, talked to family and a few friends, prepared for a week of second opinions, a trip to a top notch surgeon at the University and another melanoma specialist at the Mayo Clinic. Then on Monday I had to go to work and tell everyone there and begin the process of taking a leave from my wonderful job in compliance. That is when the miracle started. Let me say just a few words about working in compliance at the University of Minnesota before I explain the miracle that I witnessed. When I would tell people that I worked in compliance at the athletic department at the University of Minnesota I would generally get a remark about how that must be a tough job, sometimes there was a little chuckle or maybe a wink about getting people to follow the rules, but in general there was confusion about what a compliance director did on a daily basis. To this day, I don’t think anyone in my family really understands what I did in my job in compliance. But, let me assure all of you that I loved the job. I once was talking to Denise about a career change and talked about working in the audits department at the University. Denise looked at me and said no one likes auditors, why would you want to go work for them? I said, Denise, in my world auditors are a step up from being a compliance person. But I still loved my job. Every year in my annual review my boss would challenge me to think about my future and where I wanted my career to go, I always responded that I just wanted to be a good compliance director and I could see myself staying in that position until I retired. Every day in compliance brings a new challenge, a chance to help student-athletes succeed, and a chance to work with coaches as they seek to win conference and national championships. A chance to debate with the likes of Wrestling Coach J Robinson, talk philosophy with Track Coach Phil Lundin, a chance to travel with the women’s basketball team to the Final Four, a chance to work with the likes of Don Lucia, Tim Brewster, Tubby Smith, as a sports fan it was all an awe inspiring job. I often wondered how a poor kid that grew up in North Minneapolis got one of the best jobs on the University campus. For that I was thankful. I thank all of the people in athletics, the office of the general counsel, and across the University campus for the privilege to work with you. continuing to give money even after the basket and sign were taken down. Both of our work places were tremendous. Gifts of games and puzzles for Sydney and Alex, more gift certificates for food (everyone must have known what kind of cook Denise is!) Gopher shirts to give to our nurses (thanks Matty), candies and cookies and books to read. And then there was our family and friends. More books, gift cards to rent movies, more food in the freezer, fruit baskets, hospital visits. Pretty much every detail of our lives over the next few months was taken care of by someone. People wanted to help so much, we had to tell them to wait and we would let them know what we needed. One day I was talking with Brent (the guy who did the yellow wristbands) and he was telling me that he wanted Denise to put more information about the yellow wristbands on the CaringBridge website. Why I asked, it seemed that people were getting the message. Brent then said he had only distributed about 800 wristbands and he thought maybe more information would get more people to want a wristband. I laughed and then he laughed. Imagine that, a shy, quiet guy growing up in North Minneapolis who was now everyone’s favorite compliance director and Brent thought I should have more than 800 family and friends that wanted a wristband. Want more proof of a miracle, look at the numbers. Over 30,000 visits to the Caring Bridge website, 700 entries into the guestbook at the website, 500 old fashioned cards sent to our home. Certainly all of this represents a miracle of support. I doubt that anyone could be on more church prayer lists. Yes it was a miracle. Please understand that we beat the odds each step of the way. When the statistics were a survival rate of 3 months, my first chemo treatments lasted 8 months. When the side-effects were expected to be miserable, they were manageable. When things were difficult or even depressing, there was a strength that encouraged me through each day. People have told me, or written cards, or posted messages on Caringbridge that I and my family are an inspiration. Don’t believe it. What you see through me is the strength of all of your prayers. There is no other reason that I can give you for my survival, as long as or as short as you think it was, but thanks to the Lord God Almighty for your prayers and for lifting me and my family up for so long. Now, we come to the final outcome. Despite the miracle of support from all of you we did not get the miracle of a cure. We may not always get all of the things we pray for but that does not mean we don’t get a miracle. What I did get was more than the 13 months that had originally been unexpected. What I did get was a leave of absence from a great employer that allowed me to focus on myself and my family. For the first time, I was able to be with my girls on their first day of school and I had the chance to volunteer for more than a couple fourth and second grade fieldtrips. What I did get was the chance to be showered with love and support from all of you before leaving this earth. All of this is truly a miracle. At this time, I ask that you not feel sorry for me, I am in a better place, watching over all of you, continuing to cheer for the Gophers. The last thing I ask is that you all continue to look out for my family – especially Sydney and Alex. Thank you to all of you! God Bless each and every one of you.